If at first you don’t succeed, try, try and try again. It’s a well-worn mantra, but one which applies particularly well to trainer Jorge Navarro. He brings XY Jet back to Meydan for a third attempt at the $2.5million Dubai Golden Shaheen on Saturday; a race in which he’s finished second twice. Cheltenham might be on most people's minds at the moment, but we've got Super Saturday at Meydan covered too! Our expert Laura King is here to preview a card that includes two Group 1's. Laura King is back to preview this week's action at Meydan, the penultimate meeting before Super Saturday next week. There's some intriguing handicap action on the card and Laura's nap comes in the 'Curlin'. We're getting closer to the business end of the World Cup Carnival and our international expert Laura King was firing in the winners last week on GG, with no less than four winning tips. 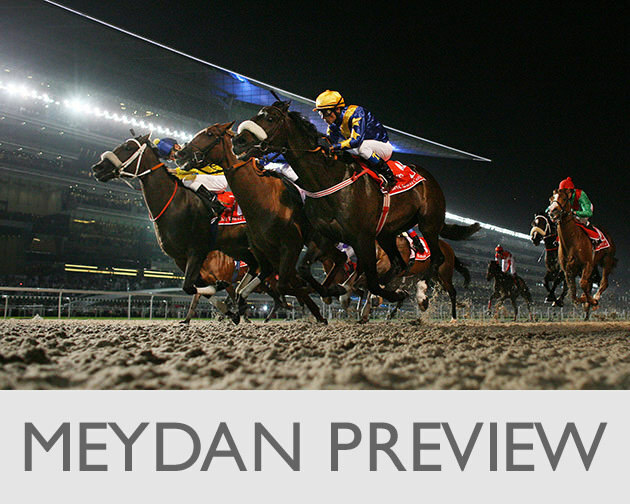 See what she has in store this week at Meydan in the video below. It's week seven of the Dubai World Cup Carnival and the stars are out to shine. Blue Point returns in the Meydan Sprint and the superstar sprinter will be tough to beat in his World Cup Night prep. Find out Laura King's thoughts on the card in the video below.